I just read "The Trouble With Movement Rates" over at ((nil) is (not(null))) Blog, and that was a thought provoking reminder of my own experiences with the problem of movement rates in my game. I think I'll chat a bit about it here. A conundrum I've run into about movement in my World of Elthos was revealed not too long ago (after three decades) when the human Player Characters in my campaign got shrunk down to tiny size. At one point they were crossing their back yard when they encountered ... ants. They were at roughly the same size as the ants at that point. And this become a bone of contention for a brief period while I worked out how to handle movement. My movement charts show that humans move 6 hexes a melee or about 36 feet every two seconds or so (at a sprint). Whether or not that's entirely accurate was not the problem ... it was that ants have a movement of 1. But when shrunk down, what is the relative movement of humans to ants. Of course I made something up, and that worked fine for the game. But it left me wondering about how to do this in a legitimate way going forward. Given the possibility of shrinking and growing, I contrived to think of movement (and also other requisite based issues which are other symptoms of the same problem of relative scales, such as strength) as relative to whatever the predominant race of my world is were the races set at the same size. Thus humans are 6 and that's the base. Ants are 8 actually because with so many legs they move faster than humans if they are the same size. Kobolds, which are already roughly the same size, or close enough, are 4, and correspond to hobbits who for whatever reason I also thought of as slower than humans on account of their smaller legs. Just kinda makes more sense to my mind. Hobbits as fast as elves would mean legs that move at hyperbolic speed. I can't take that. Anyway, Giants, relative to humans, are x times larger, but were they the same size they'd be 6. So therefore their speed is a factor of their increased size. Humans are on average in my world 5 feet tall. Thus a giant who is 30 feet tall is six times faster than a human, and therefore his movement will be 36 hexes per melee, or 216 feet every two seconds. That said I have Dwarves as slower than humans, and Elves as faster. Goblins are as fast as humans, but Kobolds and Hobbits move at the same rate as Dwarves. Horses move twice as fast as humans (though in thinking about it they probably should move three or four times as fast). Wolves move twice as fast as humans as well, and about the same speed as horses (I don't know if that is real-world accurate or not, but that's what I've got). Ghouls are faster than zombies. Zombies are faster than skeletons. However, zombies are really hard to kill and don't get tired. Skeletons are even harder to kill and don't get tired either. They're also horribly single minded, and they usually are attached to some dreadful force that has animated them and will show up and do bad things as well. Slow as molasses though. So my thinking in terms of monsters is to more or less balance out movement with other factors. I also take into account these days that movement for different races is effected by terrain. And that's a big deal. Humans do not swim at the same speed they can sprint. So there is water movement and land movement. Birds don't swim as fast as they can fly. So there's water, air and land movement. And for some races they don't move nearly so fast on land, air or water as they do in molten lava. And so on. So I have a big table that maps movement on terrains by race. That's a pain to look at, frankly, and I'm pretty sure I didn't finish it. 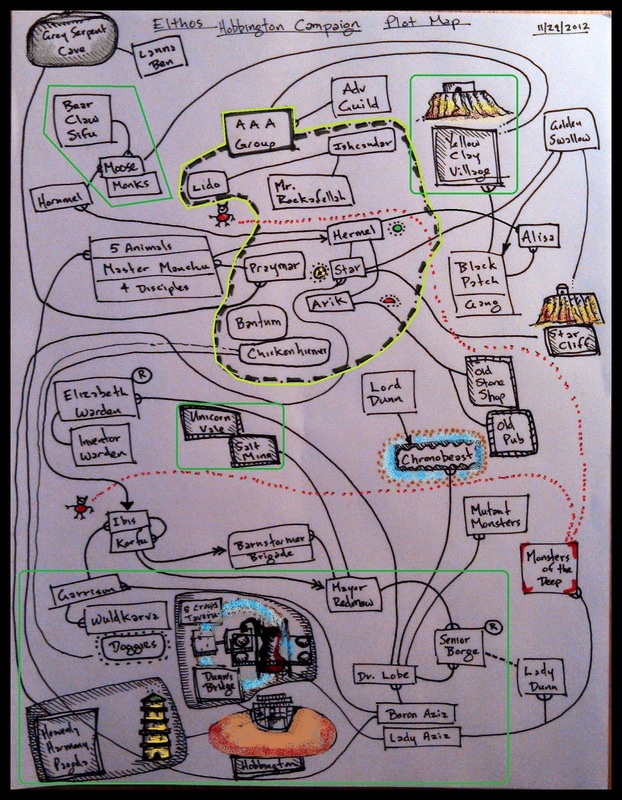 But I did get a start on it, and I do think it's basically the correct, albeit unwieldy solution. Of course in the Elthos RPG each GM is called upon to create their own worlds, and so it will be perfectly normal for some worlds to have fast hobbits, and some worlds to have slow hobbits. I'm down with that. It's fine. We all have different visions in our heads as to what is what, after all, don't we? I think that should apply to movement as well. But the key to my innovation on this is that movement charts show the relative movement to the predominant race of a given terrain. That's because humans can't fly, so their movement in the air is zero. Making other race movement factors relative to humans would, mathematically speaking, but a bad idea. So I'll pick a bird, like the Eagle, for that. Lava? Salamanders, probably, or devils maybe. Not sure. But each terrain type will probably get its own Base Race against which movement will be determined. And so, if a human does happen to learn to fly, his speed will be relative to Eagles. And of course when it comes to oddball monsters like lions with human heads and wings and stuff ... well... Lions move on the land at 6 times human speed, in the air at 8 times eagle speed, and ... you get the idea. Ok, that's all I got on that. Curious what you may think of this solution, and any advice or ideas you might have. I don't usually write about technical progress with the Elthos RPG website, but this advance is kind of a big deal for the UI. Finally, after a long time of working on other more fundamental aspects of the project, mostly on the back end, I have made a number of forays into the UI / UX space. My first major accomplishment (those who know how easy this actually is, don't laugh please - I didn't know until I tried it myself) is the implementation of JQuery Ajax to call a (don't laugh please) WebMethod and provide a data table that shows up in a label on the form. For those not too in-the-know about this sort of thing, it means that the page does not "postback" to the server, but instead smoothly glides the data onto the page unobtrusively. So the page no longer vanishes and then reappears with the data. And it's a much nicer User Experience. Ok, now back to our regularly scheduled programming. This diagram illustrates the conceptual framework of the Elthos World ... it includes the relative positions of both groups of Deities - the Cosmic Celestials and the Archetypes. The Cosmic Celestials operate in the Realm of Divine Ideas, above the conscious mind. The Archetypes, on the other hand, operate in the realm of the ID, below the subconscious mind. Wilderness adventures will have a tendency to relate to themes pertaining to the Cosmic Elkron, and quests of the upper world. Delving into dungeons and caverns will conversely explore the realms of the subconscious mind, and ultimately, if one goes deep enough, the realm of the Id. So the higher or deeper you go the more mystical the nature of the exploration becomes. 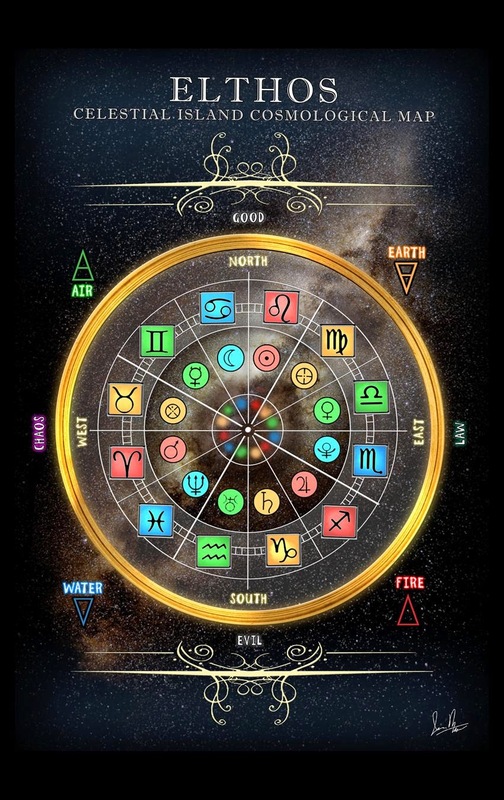 The Cosmic Celestials are represented by Zodiac and Planetary signs, while the Archetypes are represented by the Major Arcane cards of the Tarot Deck. Each Archetype has a corresponding Celestial. So if you were to imagine the two groups of Ekron overlapped they would form two disks divided into twelve pie slices, and both disks forming two concentric circles, as can be seen below. The Cosmic Celestials are pictographically represented here on the back face of the Elthos Tarot Deck. 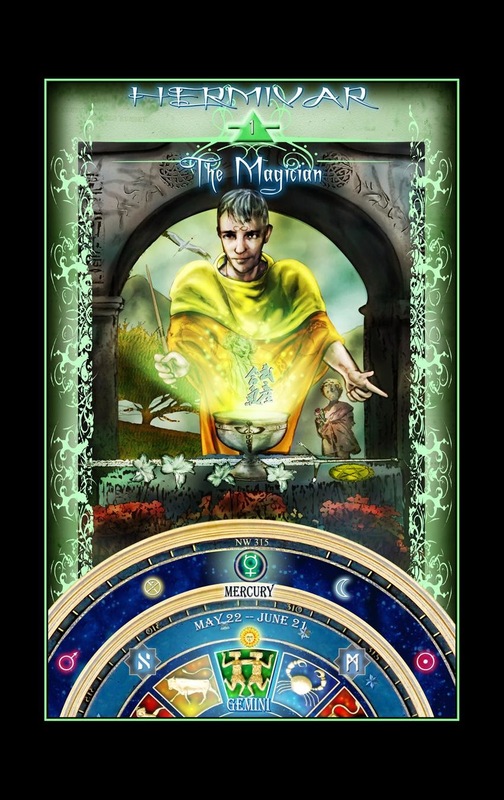 The Archetypes are represented in the Major Arcana of the Deck, and here's an example. So what we see here is that this Major Arcana card is the Archetype of The Magician, and is associated to the Planet Mercury and the Zodiac Sign of Gemini. How this all plays out in terms of Elthos, the world, is that the Elkron are Cosmological Forces of the upper and lower realms of the Mind, and personifications of the Alignments to which they are associated. They war and ally with one another in accordance with their natures and the movement of the Planets and Archetypes as they perform the Dance of the Spheres. This all happens at the Cosmological level of the Campaign wherein the purposes and circumstances of the Elkron are charted. That said, it has been very rare for Player Characters to advance high enough or deep enough to experience or comprehend the true nature of the Dance of the Elkron, or even more than a passing glimpse of it. However, it is there nevertheless, ever in motion, ever synchronizing elements of the back story with elements of the plot line. It's quite an exquisite system in many ways. Some day I do hope to rationalize it well enough to put into a book and explain to other GMs how it works, and what one might do with it. Until then, however, its to be taken as a kind of philosophic art that enhances the Elthos world in some mysterious way, as yet quite unfathomable to the Player Characters (or other GMs). Perhaps some day a particularly stellar mage will arise in the Campaign who will begin to make sense of it all.